In 1989 employees in Alberta did not have a civic holiday in the month of February. That was about to change when the Premier of Alberta, Don Getty, felt it was important for Albertans to take a day off from work and spend time with their families. He proposed the new holiday that was intended to emphasize family values. In 1990 the new holiday, Heritage Day, was proclaimed by Lieutenant Governor, Helen Hunley. The new holiday was not popular with everyone. Many employers felt that an additional statutory holiday was an unnecessary financial burden. In response to the criticism, the holiday of Heritage Day was downgraded to a civic holiday, meaning employers are not required to observe this day. Under Alberta law, the employer may choose to observe Heritage Day as a general holiday, under which rules applying to general holiday pay will be used. Alberta was the only province to have a holiday in February until Saskatchewan offered a similar holiday in 2007. Today Family Day is a statutory holiday occurring on the third Monday of February in the provinces of Alberta, Manitoba, Ontario, Prince Edward Island, and Saskatchewan. It is observed on the second Monday of February in British Columbia and in the provinces of Manitoba and Prince Edward Island, the holiday is referred to Louis Riel Day and Islander Day, respectively. Quebec, New Brunswick and Nova Scotia have regular working days in February. In Newfoundland and Labrador, the third Monday of February is a school board holiday, but not an official provincial holiday. As Family Day is a provincial holiday, federal employees in all provinces (such as public servants and postal workers) work on this day. 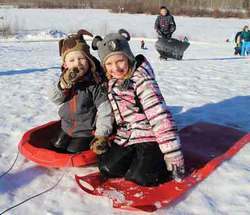 The Rotary Club and Catholic Social Services’ Sign of Hope partnered to offer a fun-filled day of activities such as horse-drawn sleigh rides, ice skating, tobogganing, and face painting at By-the-Lake Park. Hot dogs, doughnuts, and hot chocolate were provided free of charge. • Family Skate | 11 am until 7 pm | Civic Centre (4513 – 50 Avenue). • Shinny | 1:15 pm until 4:15 pm | Civic Centre (4513 – 50 Avenue). • Stick & Puck | 4:45 pm until 6:45 pm | Civic Centre (4513 – 50 Avenue). • Family / Public Swim | 1 pm until 4 pm | Aboussafy Aquatic Centre (4514 – 50 Avenue). Wetaskiwin Fire Services (WFS) provided demonstrations featuring a vehicle extrication, a tour of their trucks, and an ice rescue demonstration at By-the-Lake Park. Families were treated to a day of skiing, snowboarding and fun family events, free hot chocolate, hotdogs and family oriented activities. • Spirit of the Machine: Staff Picks from the Museum’s Collections – This exhibit showcases more than thirty rare, unusual and one-of-a kind items that are of personal significance to museum staff. Quirky, fascinating, eccentric or commonplace, these diverse pieces speak volumes about the Spirit of the Machine. • An art display of more than 50 photographs and paintings by Alberta artists Lori Frank, Darren Greenwood and Mark Vitaris highlights the beauty and mystique of the automobile. Millet hosted a family skate at the Agriplex from 12-5 p.m.
An ice sculpture artist provided a sculpturing demo and created a giant ice pelican in centre court. Other activities included dog sled races and games and crafts. The Lakedell Agricultural Society held a series of events from 2-6:30 p.m., celebrating both Family Day and the society’s 40th anniversary. There was outdoor curling, indoor games and demonstrations, children entertainment, comedian, a buffet supper and ended the day with a fireworks demonstration.